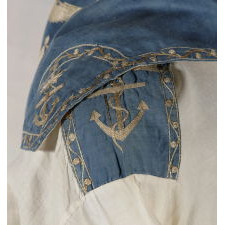 Sailor’s frock and Jack Tar style sennit, each of the Civil War period or prior, and each of the most extraordinary quality—perhaps the best that exist in private hands. 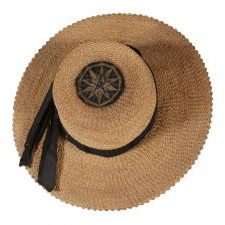 The hat may be the best in or out of institutions. 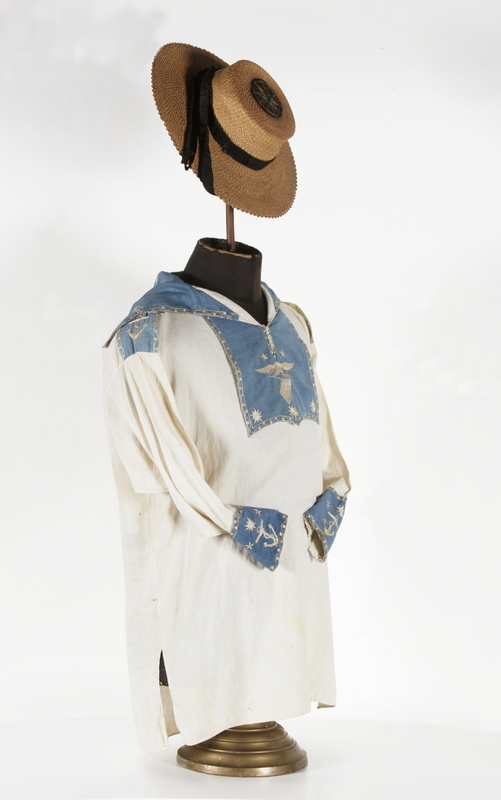 A frock in the collection of Winterthur may be the only better museum-owned example. 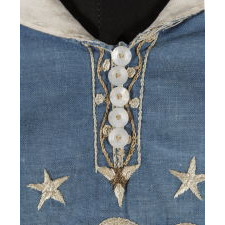 The shirt is summer weight issue and while often seen with stars at each corner on the collar’s tail, the embellishment on this example is extraordinary among surviving examples. 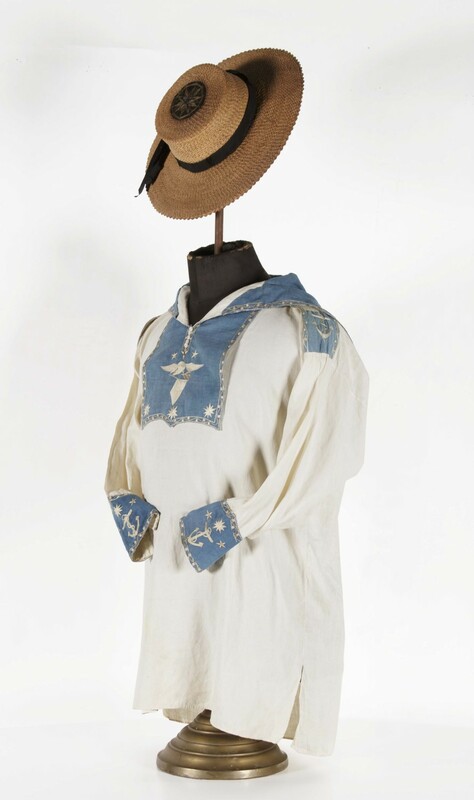 The body of this is made of a grade of white linen called “Barnsley sheeting,” which is probably American produced, but named for English linen associated with the town of Barnsley in South Yorkshire. 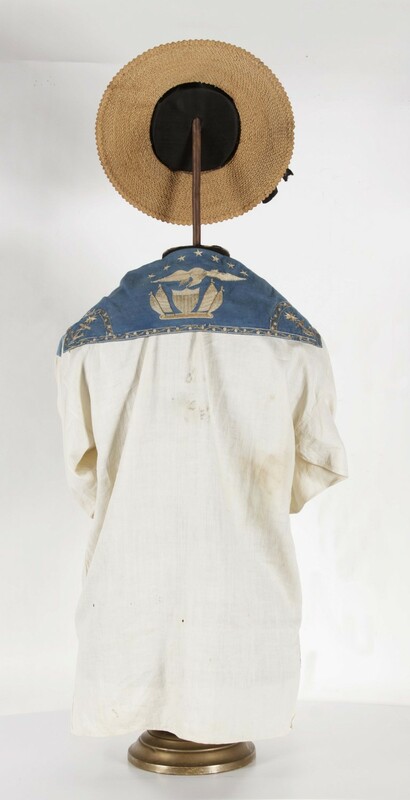 The bib, tail, shoulder straps, and cuffs are of blue Chinese export “Nankin” cotton (nick-named for the city of Nanking). All of the decoration is rendered with silk floss in white and gold. 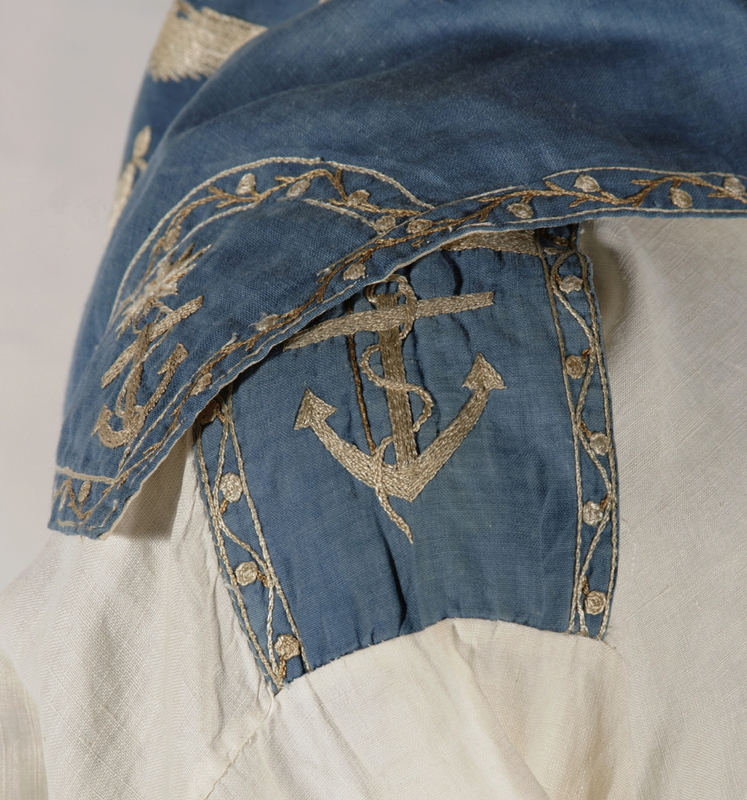 The edges of the blue elements are trimmed with an attractive, chain-stitched vine and berry border within two rows of chain stitchery. 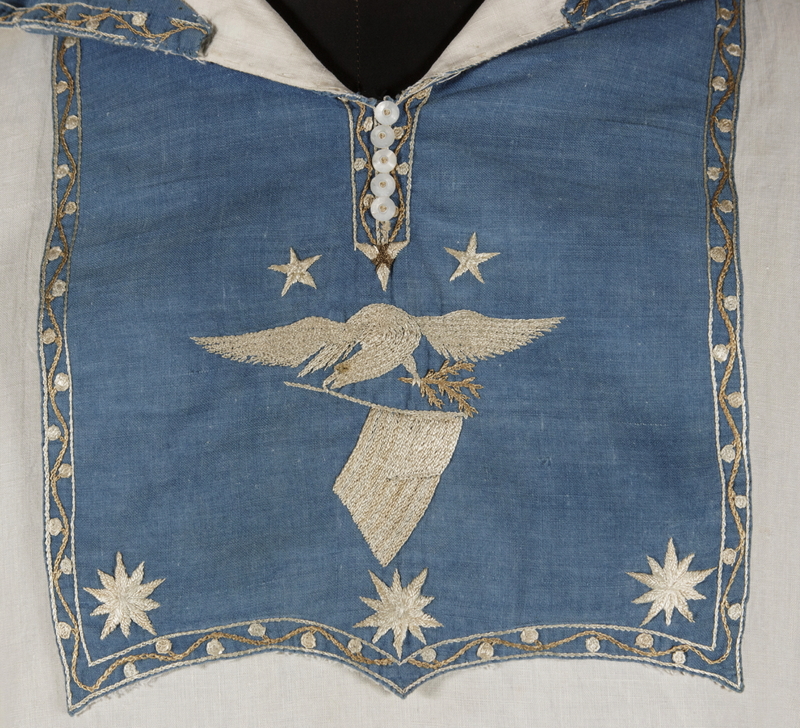 Embroidery on the bib includes 2 five-pointed stars above a spread-winged eagle, gripping an American flag in its beak and bearing an olive branch in its right talon. 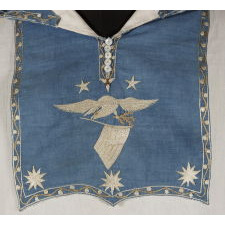 Along the bottom are 3 eight-pointed, mariner's compasses. 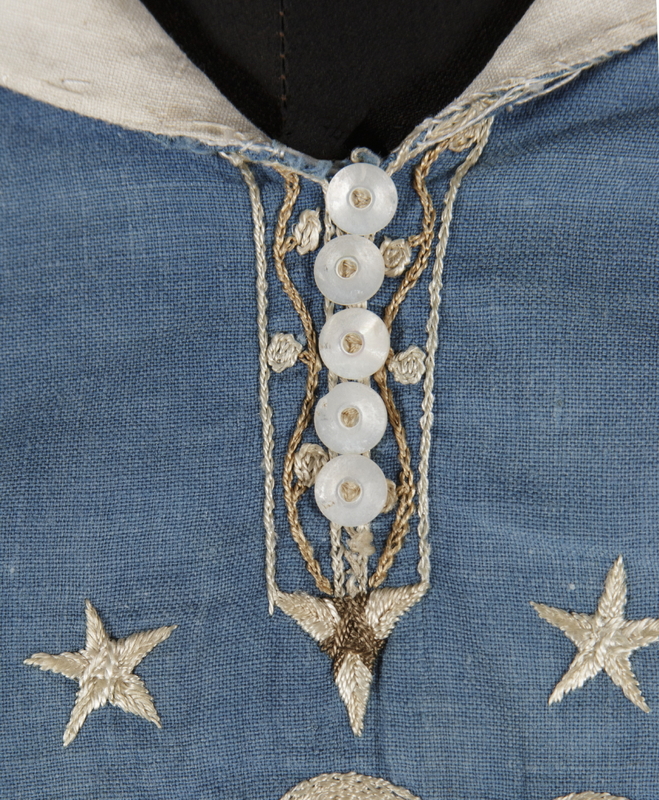 There are 5 buttons made of nacre (mother of pearl), trimmed with the vine and berry border, which terminates at the bottom in what appears to be a rendering of a shark’s tooth pendant. 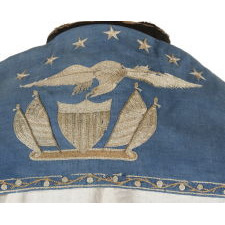 On the back is an arch of (7 five-pointed stars, beneath which is another spread-winged eagle with the tip of its beak meeting the scalloped peak of a federal shield, beside which are 4 tipped American flags, all on a elongated base with rounded ends. 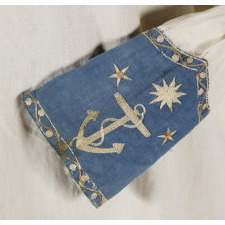 There are anchors at each outer corner, each of which is set beneath a mariner’s compass, and there are anchors on the shoulder straps. 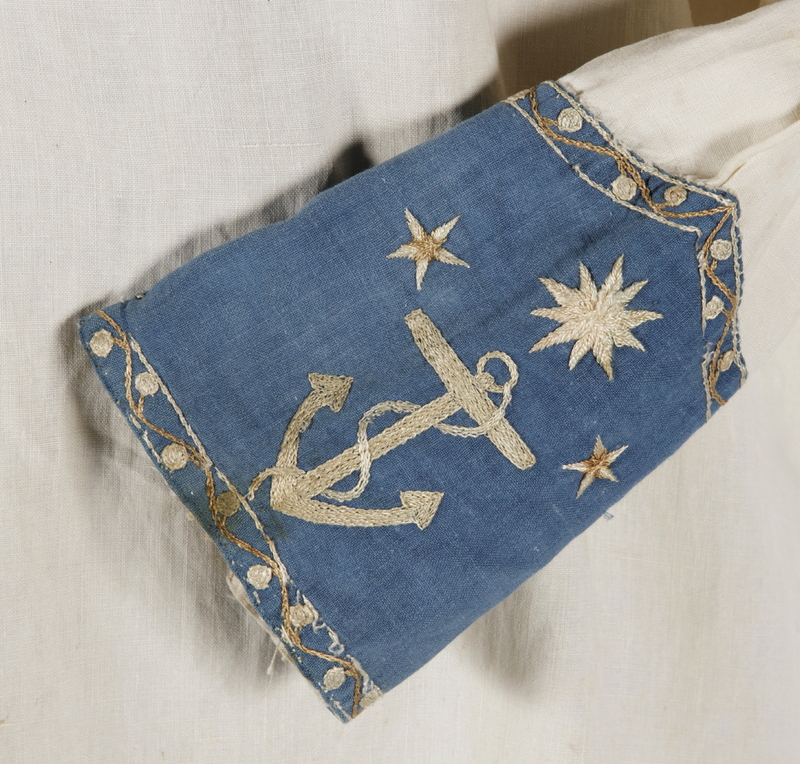 Two more anchors on the cuffs are set beneath mariner’s compasses and flanked on each side by two more five-pointed stars. The fact that the number of 5-pointed stars totals 13 is not coincidental. 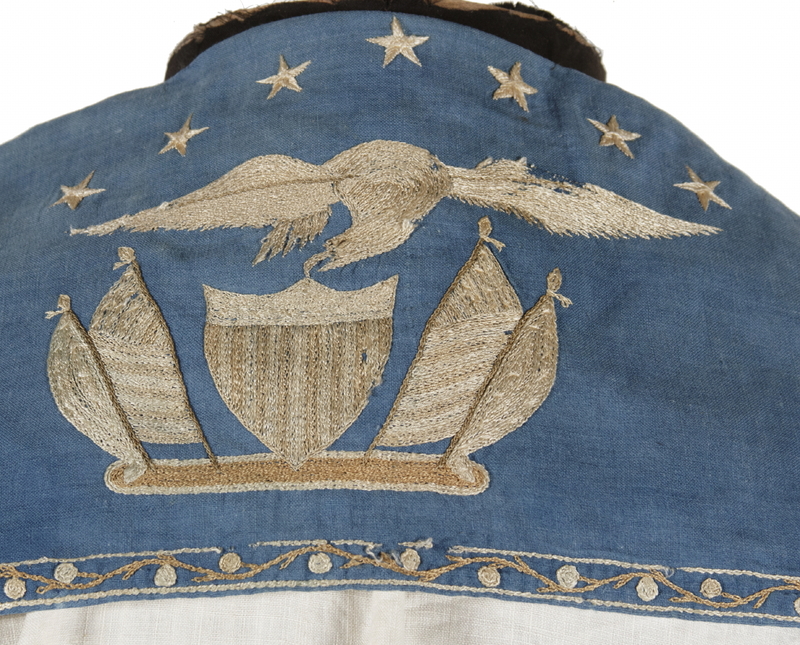 This star count was used by the navy on small boats and on many commissioning pennants for practical reasons, but it was in all cases a tie to American independence and our colonial past. The straw, flat-brimmed sennit has a sawtooth edge and a black ribbon around the cylindrical crown, that is decorated on top with a large mariner’s compass. 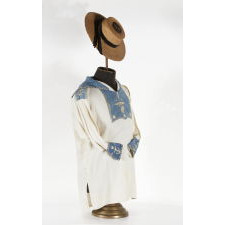 Like the jacket, the hat is simply exceptional, a rare survivor, and the best of its genre that I know to exist. 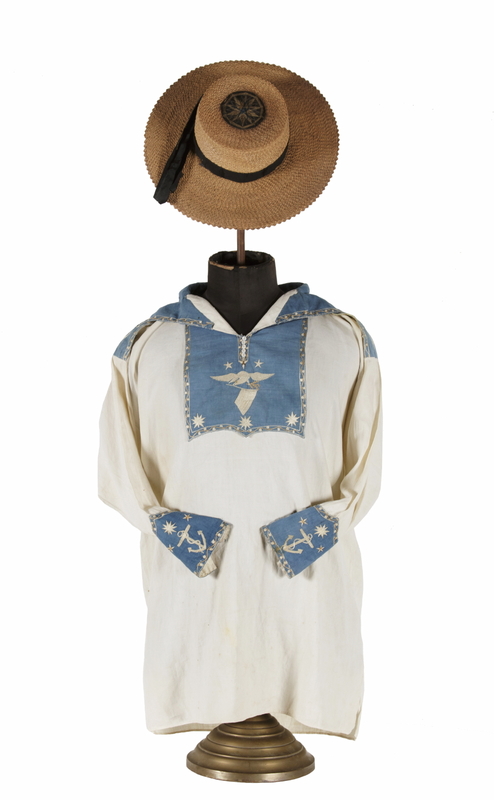 The hat and frock have been together for some time and appear, due to their unusual quality and state of preservation, to have probably originated together. Each is in remarkable condition for the period. There are minor holes under the collar of the shirt and one small separation along a seam on a sleeve was repaired. 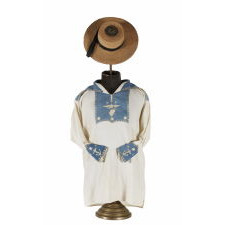 The shirt has very minor soiling considering the age, color, and use. There is some fading of the cotton and of the gold silk floss. The hat has no significant apologies. 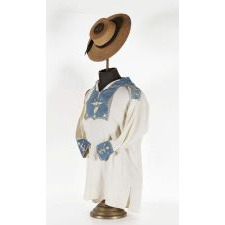 Mount: I married the hat and shirt to this 1890’s, black satin-covered, paper-mache mannequin, which has a brass base. 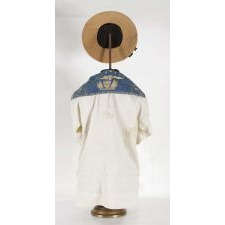 The wooden shaft that supports a foam hat form, which I wrapped in black fabric, is salvaged from a Civil War era parade flag staff.